One day last October, I was doing the dishes in the upstairs kitchen and checking, as one does, bird activity in the two bird baths below when this unusual one arrived. I keep my binoculars on the kitchen window sill for moments like this and I was astonished to see that it was a male Satin Flycatcher, very rare in North Queensland. Happily it stayed around long enough for me to grab the camera and get a few photo both at the bird bath and, second photo, in a nearby shrub before it flew away. Satin Flycatchers are notoriously difficult to distinguish from their close relatives Leaden Flycatchers but in the right light and at the right angle – i.e. from above – the overall satiny blue sheen is unmistakable. Leaden Flycatcher last featured as bird of the week/moment in 2003 with this one photo below, so now is a good opportunity to review it and the question of distinguishing the two species. 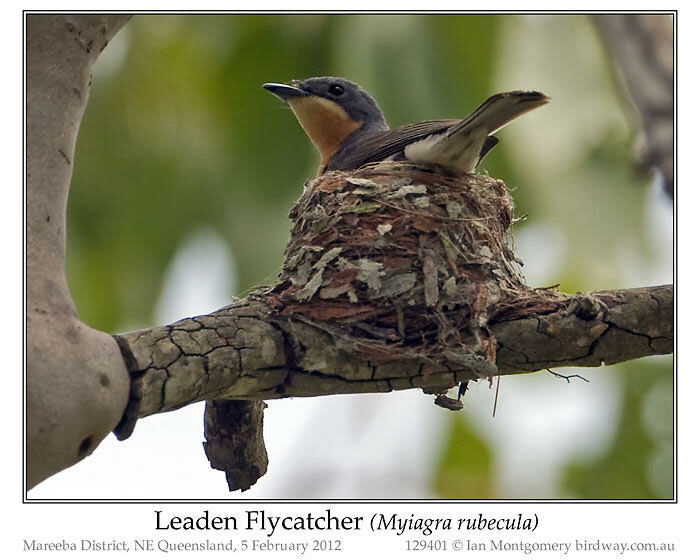 Graeme Chapman wrote an article – ‘Mixed Up Myiagras’ – on identifying Monarch Flycatchers in the June 2003 issue of Wingspan, the Birds Australia magazine and I’m going to quote extensively from that. 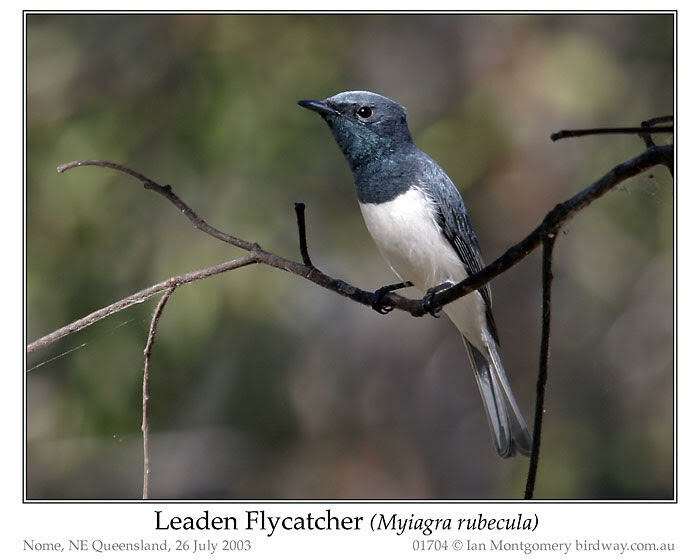 The key field mark for distinguishing Leaden and Satin Flycatchers is the shape of the demarcation between the dark throat patch and the white breast and belly. In the male Leaden Flycatcher (above) the line curves upwards where the dark throat patch meets the wing producing a right angle or slightly acute angle in the white part. In the Satin Flycatcher, see the next two photos, the demarcation curves downward at the sides where it disappears below the wing and there is no sharp angle, rather a curve through a decidedly obtuse angle. This is perhaps easier to see in the photo below, where the bird is obligingly lifting its wing as it preens. To add to the problem, male Leaden Flycatchers have a bluish sheen on the throat patch and to a lesser extent on the head. Given the refractive, iridescent nature of such colours in feathers (optical structure rather than pigment) the actual colour produced depends on light conditions and angle. 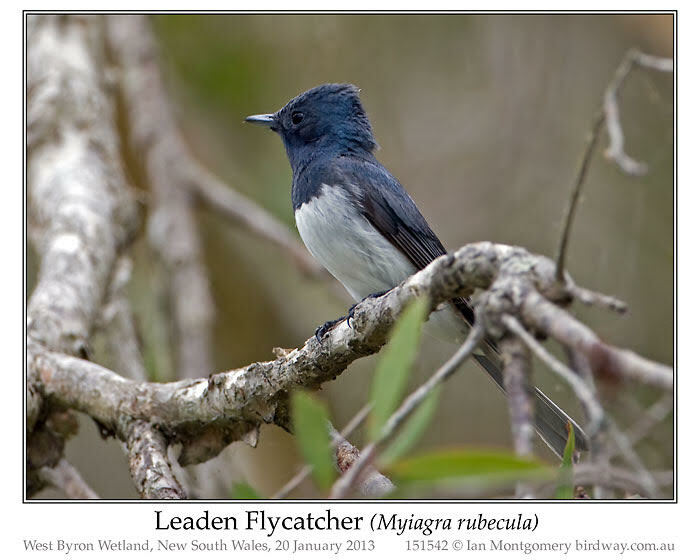 The Leaden Flycatcher in the photo below looks quite bluish (thought the back and wings are greyer) and could easily be mistaken for a Satin. Here the angle of the white area comes to the rescue and this bird is definitely a Leaden. I haven’t mentioned females or juveniles yet: they’re even harder than the males. Females and juveniles of both species have reddish buff breasts but these are very variable in intensity and lack the clear demarcation with the white breast that comes to the aid of identifying males. In general, female Satins are darker overall than Leadens and have a bluish sheen on the head. But be warned, the heads of female Leadens can be slightly bluish too as in the photo below. I regret that I haven’t got a photo of a female Satin. If all else fails, habitat, location and time of year are important. 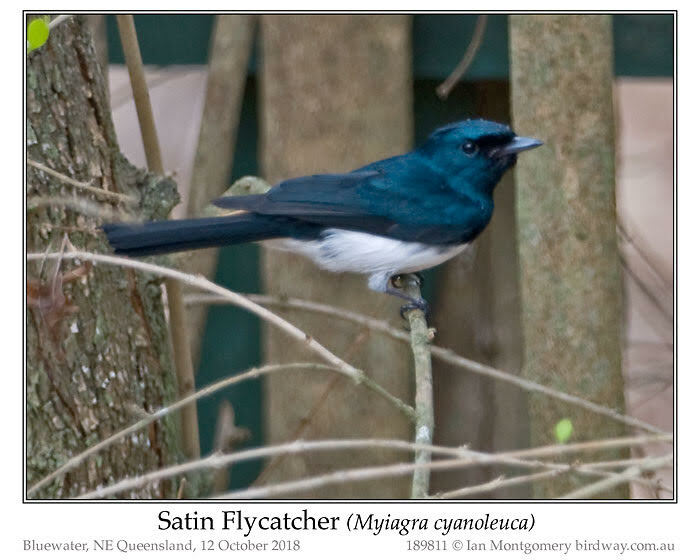 Satin Flycatchers breed in moist forests; in Tasmania (from which Leadens are absent) and Victoria this includes both inland and coastal forests but in New South Wales the Satin occurs only in damp wooded gullies in the high country along the Great Dividing Range. Given the problems of identification, there is uncertainty whether they breed in Southeast Queensland and Graeme Chapman couldn’t confirm breeding there. John Young reported finding breeding pairs in Northern Queensland in highland rainforest (two pairs near Paluma, December 1984, and one pair at Wallaman Falls, November 1991) but it isn’t known whether this is part of its normal breeding range or even the same race as he reported the birds as being larger and darker than southern ones and the eggs being 20% larger. 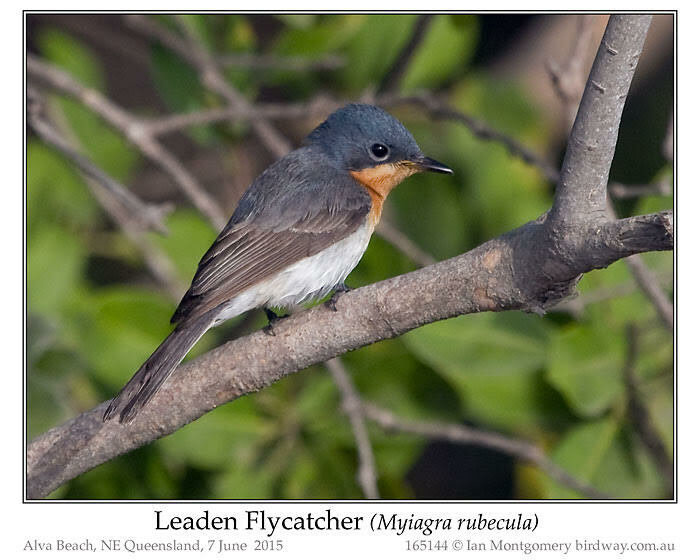 Leaden Flycatchers occur in a wide variety of wooded habitats and may be found breeding in the same areas as Satin Flycatchers. 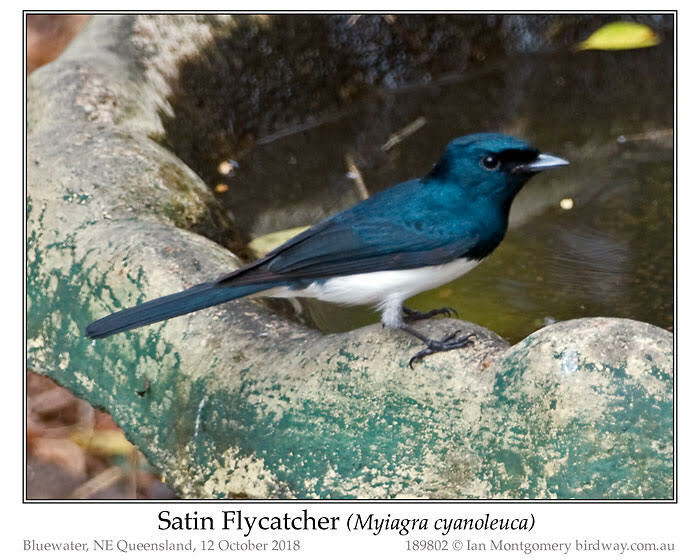 Timing is important as the Satin Flycatcher is a migrant and winters mainly in New Guinea. The late Andrée Griffin lived in Paluma, about 40km from my place as the flycatcher flies, for many years and kept careful records of birds. 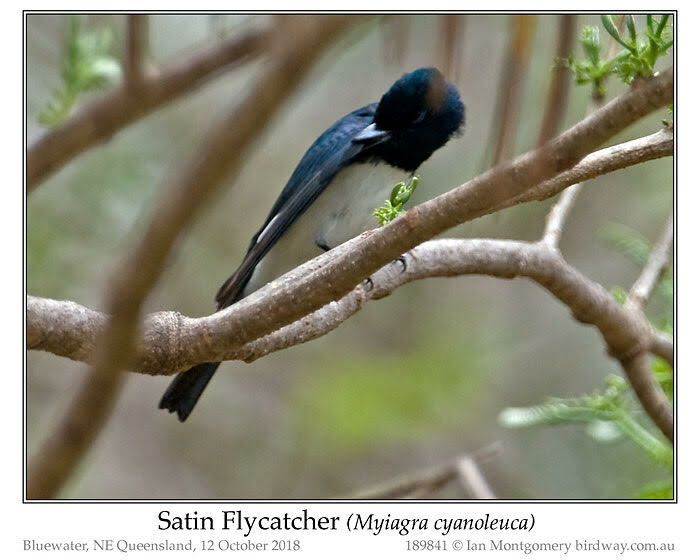 She reported to Graeme Chapman that Satin Flycatchers arrived there each year on their way south at the beginning of October and were seen for about a fortnight. That date coincides well with my record of 12 October and Len Ezzy, a local birder, recorded one a week later at the Townsville Town Common. 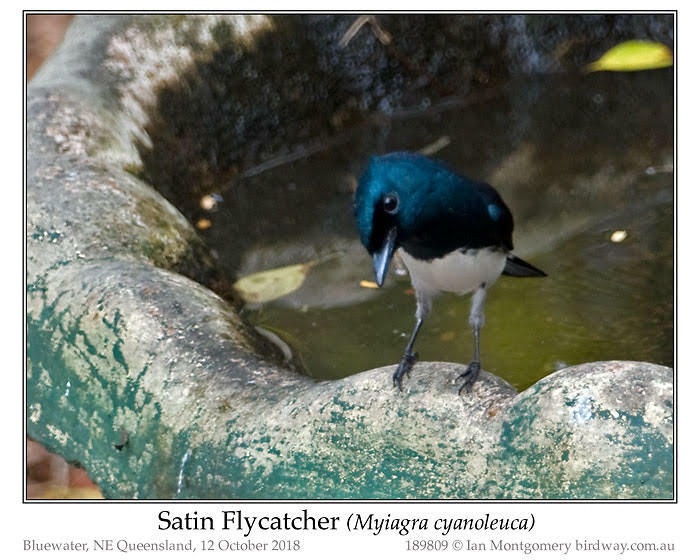 In 2016, I thought I saw a female Satin Flycatcher having a bathe in my pool on 22 September, but she didn’t hang around while I got the camera. 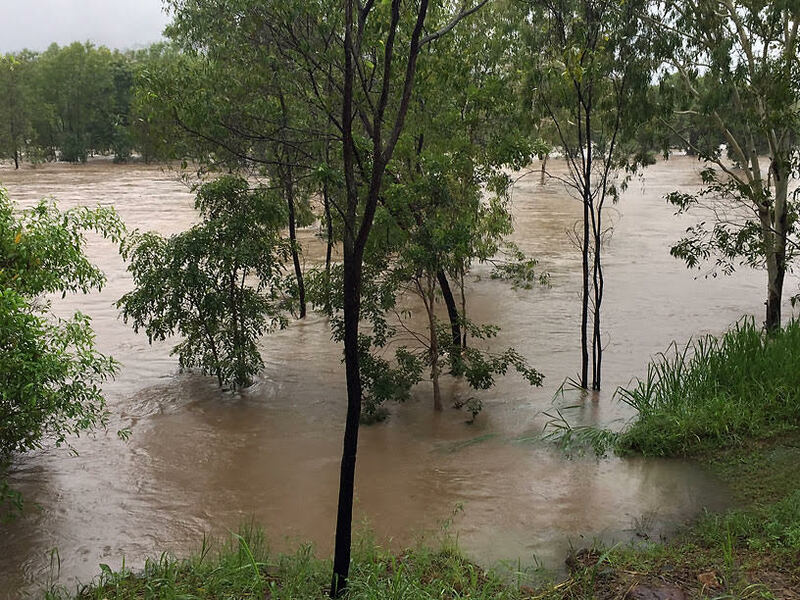 For those of you who have heard the news about flooding in Townsville in general and Bluewater in particular on Wednesday, I’m happy to report that my house is high up enough above the creek to have been spared so far, unlike some unfortunate residents farther down the creek. Upper Bluewater has had over 900mm of rain in the last three days and it is hard to imagine it ever exceeding that. This is what Bluewater Creek looked like from just outside my house shortly after the flood peaked on Wednesday. The creek is normally invisible from here in a gorge about 200 metres away where the distant trees are. Ian’s Birds of the Moment come in quite unannounced. Never know when to expect something from “down under.” Yet, everytime, Ian has a very interesting bird/birds to introduce us to. Thank you, Ian for stopping by with another set of beautiful avian wonders. The verses below remind us that the Lord provides for his critters and birds. In this case, the “hills” might have been a bit over filled.